It�s not just the fact that defenseless young children are victims of unscrupulous people who use them in networks for pedophiles. The most disgusting aspect of this is that these circuits are visited by people who occupy important positions in daily life. Individuals who show a respectable and neat appearance to the outside world. But once they show up in this nauseating business, their fortune is their entrance ticket so they can abuse these innocent children. Joe (Joaquin Phoenix) is someone who wants to set things straight. Armed with a heavy hammer, he beats those perverts from their victims. 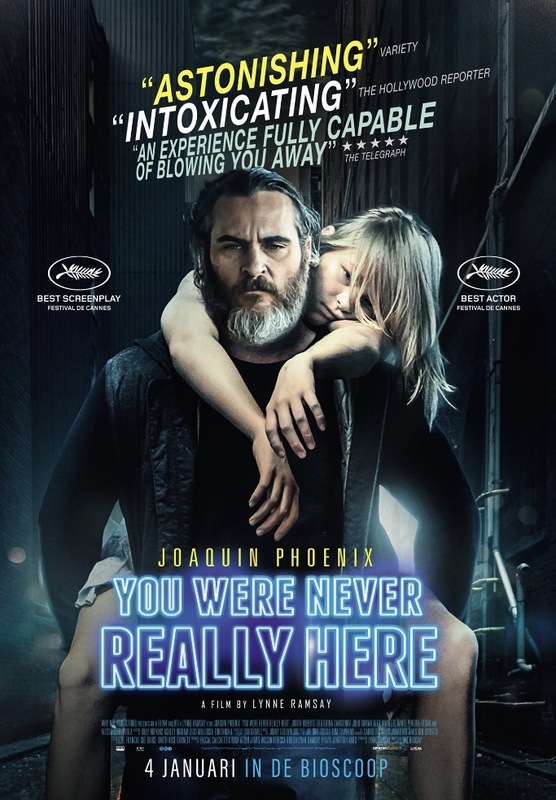 But �You were never really here� is not just about the existence of children�s networks. The film also tries to paint a picture of the person Joe who is daily tormented by his own demons. Every time Joe gets on screen, you just feel that heavy burden on his shoulders. He�s suicidal and exposes a murderous resentment. And this because of a youth full of violence, which is sporadically portrayed in haunting flashbacks. But also because of his war record. His scarred upper torso is probably caused by these events. And perhaps mentally there are even more profound wounds. Hence his fatalistic attitude. A �Je mon fou� posture which makes him walk into a lion�s den without hesitation. And as a result, he also carries out life-threatening or self-mutilating actions. Pulling a plastic bag over your head isn�t exactly something normal functioning people do on a regular basis. It�s clear that PTSD also has something to do with this. Are you expecting to see explicit violence? You�ll be slightly disappointed. Violence is abundantly present but is always kept out of the picture in a strategic way. There are a modest number of bloody scenes, but predominantly the violent and repulsive images are kept out of sight. But don�t doubt it. Joe is an aggressive and insensitive (At least at that level) disposer of persons of poor moral character who�ll split the skull of these persons in two without hesitation. However, his last intervention sets an influential mechanism in motion where he himself threatens to become a victim. Perhaps for some, it�s a tad too arty and the speed of the film a bit too slow. Yet Lynne Ramsay knows how to make a stylistic revenge film. The entire film is filled with dreamy (almost hallucinatory) fragments and perfectly framed snapshots. A child�s voice counting down softly. The sinking of a human body into the water. A close up of dripping wet hair. Joe staring into the distance. The biggest part of the film is also filmed in a dark and murky set-up. Probably as dark as the deformed and pained spirit of Joe. The interpretation by Joaquin Phoenix is breathtaking. Maybe rough around the edges, but deep inside a softy. A man without too many words, with a raw personality and with an impressive beard. As he strolls through New York, he looks like a homeless bum on his way to the soup kitchen at some community center. In reality, he�s a man with a well-defined mission. �You were never really here� certainly doesn�t belong in the list of boring uniformity that�s lately being produced in Hollywood. The film is more a character study than simply a revenge film. It�s the kind of film that gets under your skin. I was a fan of Joaquin Phoenix anyway, but because of his undeniably fantastic acting performance in this film, he rises a bit more into the leading group of actors who are unmatchable in terms of acting.